And Jesus took a child and put him in the midst of them, and taking him in His arms, He said to them, "Whoever receives one such child in My name receives Me, and whoever receives Me, receives not Me but Him who sent me". My card is not only for the Carriers of Faith blog hop, but also for Crafter's Cafe. The theme at Crafter's Cafe is Spring...and I used an image from Inky Impressions called "Maddie Spreading Love". So how does this apply to the Carriers of Faith? Well, not only is it a picture of a young girl...but even the name of the image including "Spreading Love". Isn't that what we are called to do? To share the love of Jesus and spread His love? I heard a song one day while I was in my craft room listening to KLOVE on the internet. The song talked about how he wanted people to see Jesus through him. That has become my prayer....I pray that when people see me - they see Him...that when they talk to me - they hear Him coming through...that in some way my life is a reflection of all He has done for me. I'm blessed. And I pray that today He will bless you in a very special way!! Your next stop on the Carriers of Faith blog hop is Paula...spend some time there - she's another amazing talent!!! 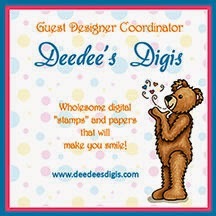 Your card is so pretty... lovely soft colors, adorable little girl image, great details (like the doily).... AWESOME! Love it!!! Finally I found your blog!!! Yay, I also joined it!! I owe you an email ..
your card here is beautiful! Cute Card Zella--I love that it works for both of the challenges today. Great image and sweet colors too. AND--I love the flowers on your blog background! Wow! You got it going on with all of those design elements! Lovely! Darling image and love your layout too! I love to imagine people will see HIM when they meet me and talk with me- wonderfully said! OH Zella, this is perfect!! What a charming card, so full of life and fun and colors! Indeed He does ask of us that we bring life to the best that we can - your card certainly reflects that! We miss you! Blessings! I love the girly-ness of this card! So very fun! Pretty card in lovely soft colours. Thank you for joining us at Pinspirational Challenges. Come back next week!